The 2017 Freightmore All Tar Rally will consist of 9 Special Stages. Two will be run on Friday evening starting at 18h00 and seven on Saturday starting at 09h00. The final two stages will be the customary Super Special with the finish anticipated to be 16h00. R70 entrance for spectators covers both days and with an anticipated 30-35 entries present it will be great entertainment as Clubmans cars will be going flatout to beat the rally cars on a surface that certainly favours the racers. There will be commentary on the track PA and hopefully Killarney Radio 108Fm will be active too, allowing you to spectate from your car and still listen in on the latest news. There will be a jumping castle and karts for the kids as well as a special guest appearance by the comedian Gary Naidoo (and it is not Kes with a wig). Documentation and Scrutineering in the new pit complex on Thursday evening from 19h30 whilst the numbers function is set for Thursday 20 July at the CPMCC Rollbar. Thank you to sponsors Freightmore, Wikideals, Socialite, Tikaways Signs, Quickshade. Expect a few more chicanes as Lizelle and Marizca does not enjoy working in their respective offices wearing helmets. Word of advice - avoid the walls they inevitably prove to be harder than any car! Twenty one days to the annual All Tar Rally which includes the Race / Rally Challenge as Midas Clubmans, Access Auto Fine Cars and Mutlu Batteries Classic Car competitors accept the opportunity to measure their tarmac expertise against the all surfaces abilities of the rallyists. Dirk and Dirk Kruger always a serious threat for overall honours in their legendary Midas Clubmans Toyota Corolla and then Danie van Niekerk have staked a claim in his very well driven Wingfield Motors E36 BMW 328i. Or will Gavin Cerff finally reach the finish of an All Tar Rally with that rapid Spur VW Golf MkI intact! Two events in the same calender month is not recommended but if this is the only alternate date available it has to do. Round 5 of 6 in the 2017 Western Province Rally Championship brings a very unique challenge to the series. Tarmac very hard on cars and testing on crews as a momentary lapse in concentration could results in instant retirement at the Killarney International Raceway. 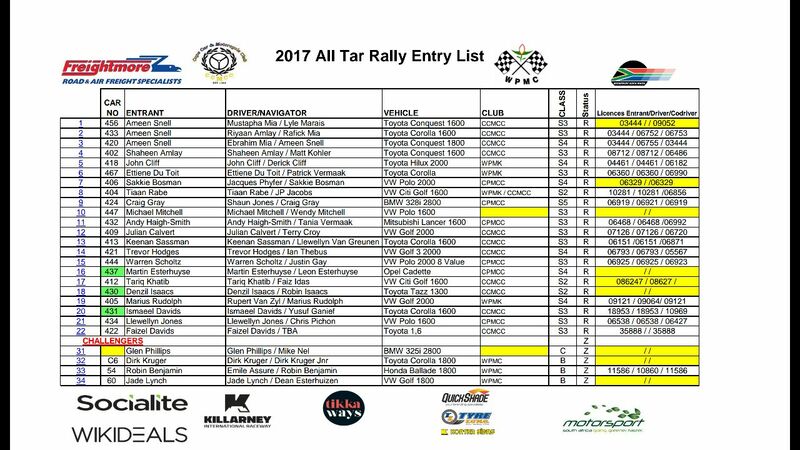 The entry list for the CCMCC / WPMC All Tar Rally reflect a twenty one car presence in the rally category and four for the racing car category, but this event normally has a number of late entries leading into the actual event and 28/29 July 2017 will undoubtedly result in another very entertaining and challenging 98km of special stages.